Konrad Kapler, a Polish schoolboy international, signed for Celtic in August, 1947 from Forres Mechanics. The Polish-born outside-right had signed for Forres after being spotted playing for the Polish Army side in an exhibition game and electing to remain in the UK instead of returning to Poland. 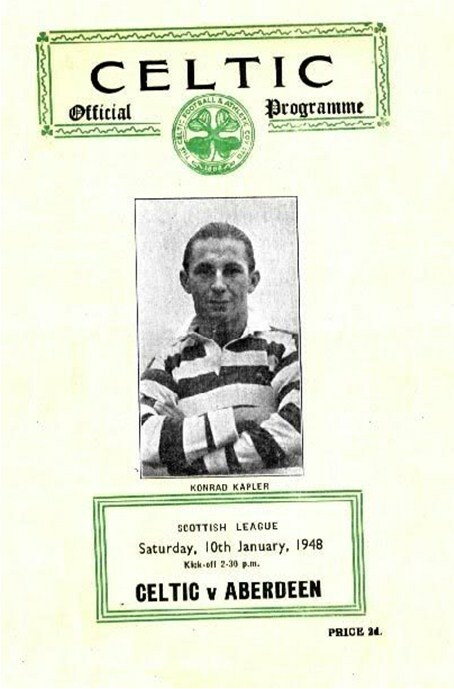 Konrad made his ‘Hoops’ debut in a 3-1 Glasgow Cup defeat at home to Third Lanark on September 10th 1947. A quick player, who loved to try his luck at goal from all ranges and angles, Kapler unfortunately never established himself as a Celtic regular and he was released in 1949 after a total of eight competitive appearances. Moving south he joined Rochdale in May 1949 but only managed to play 4 games in the 1949/50 season before moving on to Morecambe for the 50/51 season, where he quickly established himself, playing 37 league and 10 cup games, scoring twice and playing in the Lancashire Junior Cup final, where he turned out against former Altrincham favourite, Albert Foulds, who was then playing for Rochdale. 1951/52 saw Konrad’s arrival at Moss Lane, and he scored on his Altrincham debut in a 3-1 Moss Lane win over Hyde United. He finished his first season missing just 2 games and scoring 9 goals. He also recommended another Polish player, Adam Wasileski, who unfortunately didn’t make the grade, scoring once in 4 games. , The following season (52/53), a goal in each round saw Konrad help Altrincham through to the final of the Cheshire Senior Cup where, in front of a crowd of 7,250, Altrincham lost 2-1 to Stalybridge Celtic. Once again, though, Konrad was a near ever-present on the left wing, missing only one game all season. 1953/54 saw Konrad as once again a near ever present, missing just 4 games all season. Never a heavy goal scorer himself, Konrad did, however, provide the ammunition for other Altrincham forwards, such as Walter Jones. In 1954/55 Altrincham continued to struggle but Konrad continued to put in high quality performances, playing 44 league and cup games and contributing 5 goals, but the club won nothing. 1955/56 was different, Altrincham made it through, once again, to the final of the Cheshire Senior Cup, losing 0-1 to Witton Albion. This was also the first season that Kon missed games through injury, managing only 29 league games for the season, in addition to 5 cup games. He did, however, contribute 4 more goals, including a brace in a 6-2 win over Mossley at Seal Park. Konrad was to play one final season, (his sixth), for Altrincham in 1956/57, which took him past 250 games for the club. Once again, it was disappointing from a results point of view and, at 32, Konrad’s best days were behind him. 1957/58 saw play at both Congleton and Stalybridge Celtic, followed by a season at Mossley in 1958/59. Konrad finally finished his career with a short spell at Ashton United in 1959/60. He continued to live in Rochdale and died there in October 1991. The tables below show, for each season, the number of appearances in each category, followed by the number of goals scored. Cliff Stanton made a brief, but dramatic, impact on joining Altrincham as an 18 year-old forward, having played his junior football with the Greek Street Baptists in Stockport. He was the first Altrincham player to register 50 goals in a season and seemed at the time, destined for far greater things which, sadly, failed to materialise. Cliff had been educated at Stockport Grammar School and was considered a good all-round sportsman, playing soccer and bowling left-arm fast for Stockport CC. He made his Altrincham debut just 16 days after his 18th birthday at Moss Lane in the 1926/27 season's opening fixture against Eccles Borough. He marked the occasion with a sensational debut hat-trick in a 4-1 win. He followed this up three days later with the only goal in a 1-0 home win over Runcorn. Small for a centre forward, Stanton made up for his lack of inches with pace, timing and lethal finishing which served him well at Cheshire County League level. His performances for Altrincham were nothing short of sensational and he appeared to score goals for fun, which naturally led to Football League scouts noting his progress from very early in the season. In a season where Altrincham finished only 9th in the league they still scored 129 goals, (142 in all competitions), with Stanton scoring over a third of them! Representative honours also came quickly, with Stanton being picked to represent Cheshire where, naturally, he marked this County debut with a hat trick! He finished the season having 50 goals for Altrincham in just 43 games, ending the season with a flourish, with four goals in each of his last two games, (to go with 4 other hat tricks), thus seeming to ensure that his future lay away from Moss Lane and at a higher level! Oldham Athletic were the team that signed him and the following season he encouragingly scored five goals in his first six games for Oldham Athletic reserves but then found it difficult to break into the first team, playing in only 7 league and 1 FA cup games. However, he did score 4 goals. Unfortunately, the following season also proved a struggle, as he managed only 1 goal in the 6 league games he was selected for and was released at the end of the season to join Macclesfield Town. Cliff immediately rediscovered his shooting boots and scored 32 goals during the 1929/30 season and also gained selection for the Cheshire League against the Welsh League in March 1930. This inspired Oldham Athletic to re-sign him in May 1930 but, once again, he failed to establish himself, scoring just once in 5 matches, whilst playing at outside-right and he was subsequently released in April 1931. In the tables below, appearances are followed by goals (in brackets). Winner of a dozen football medals, along with an £80 cup and a gold medal in Rufe Naylor's running handicap, Ernest (nicknamed "Pep or Pepper") Bracegirdle, of Moorside, Knutsford, was well known to most sporting folk throughout Lancashire and Cheshire - if not for his football, then for his running. A native of Knutsford, 'Pep' went to Edgerton Boys' School, starring in the school football team as a centre-forward. After leaving school, he joined Knutsford A.F.C. as a sixteen year-old and played for Knutsford between the years 1902-05, when they reached the third round of the Cheshire Amateur Cup and ‘Pep’ once scored 6 goals in a game. Ernest was described as a small man but quick and with an eye for the goal. After three seasons at Knutsford, Ernest joined Northwich Victoria for the 1905/06 season and picked up a Cheshire Senior Cup finalist's medal in a season that saw him score 13 goals. In addition, he was selected to play for Cheshire against Lancashire. Cheshire won and Ernest scored three goals. It was during this time that he took up running, competing in a footballers' handicap at Warrington and beating Jack Fish, a well-known Rugby player, Pullen of Bury and Ruddick of Salford in a 100 yards sprint. In addition to football he did a lot of sprinting around Manchester and entered for £60 and £80 handicaps. He won the Rufe Naylor's handicap. (Rufus ‘Rufe’ Naylor was a famous Australian sports promoter who took a stable of athletes to South Africa to compete in prize races, eventually bringing this concept to Britain). Ernest’s playing career however dipped and he managed only two League appearances in 1908/09, which was followed in 1909/10, (when Blackburn finished third in Division 1), with 17 league games and 1 goal and his subsequent release, the following season. 1911/12 and 1912/13 saw him at Crewe Alexandra, who had just joined the Central League and, in two seasons, Ernest played 66 games and scored 10 goals, winning the Cheshire Senior Cup in 1911/12, where he scored in the 4-1 win over Stalybridge Celtic. A return to Northwich Victoria for 1913/14 brought little success; third place in the Lancashire Combination and a finalist’s medal in the Altrincham and District Cup. This was followed in 1914/15 with a winner’s medal in the Altrincham and District Cup. At the end of the season Northwich decided to call a halt to football due to the war so 1915/16 saw Ernest turning out for Altrincham in 10 games, scoring once, before joining the army in November 1915. He subsequently played war-time football, whilst on leave, for Manchester United (1915/16, 7 games and 1 goal), Northwich Victoria (1918/19) and Oldham Athletic, (1918/19, 2-0). 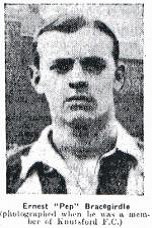 On demob, Ernest rejoined Altrincham in October 1919 for their inaugural season in the Cheshire County League and was an ever-present on the left wing, playing 32 games, scoring twice. The following, 1920/21 season he played a further 35 games and scored another 2 goals on the left wing. His final stop was Winsford United playing the 1921/22 season before he broke his leg in September 1922 in a match against Northwich Victoria, an injury which finished his active career in football. He was held in high esteem by everyone who came into contact with him and, after his accident, Blackburn Rovers played a benefit match for him. Once retired, Ernest played billiards and snooker and keenly followed football and sprinting. One son, Ernest, later played for Altrincham and another son, Chris, played for Knutsford.